Flickr user Karen Elwell meticulously documents folk art and textiles of Southern Mexico. And a recent photo of hers overlaps nicely with our love of squirrels! 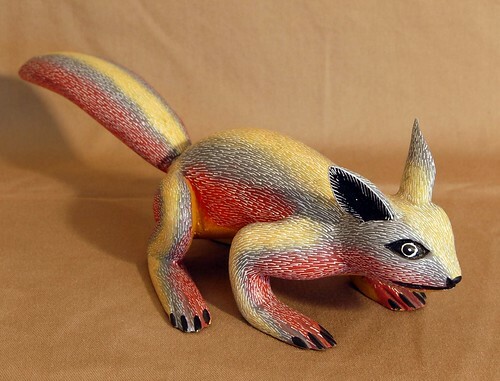 Alebrijes are funky wooden carvings that come from the Mexican state of Oaxaca (wah-ha-ka). This little ardillita is especially plump for an alebrijes — many look like neon stick figures. For more on alebrijes, see this Flickr set. And read this for more on Mexican folk art. As visitors to mi cuidad know, these can be found in many of the art mercados in Mexico City for a fraction of what they cost in U.S. stores.